Jay Ellis was a very nice, knowledgeable, and beloved paranormal investigator who unfortunately passed away last year. Jay loved to investigate Octagon Hall and communicate with little “Mary-Elizabeth,” one of the old plantation’s resident ghosts. During a private ghost investigation back in March, while having a session in the family graveyard where Mary-Elizabeth is buried, my friend Joe asked her about Jay. It was obvious that she misses him terribly. Posted in creepy, Ghost Hunting, Ghosts, Haunted, Kentucky, legends, Paranormal, Paranormal Investigation, Scary, Spooky, Supernatural and tagged Franklin Kentucky, ghost stories, Octagon Hall, spirits on July 5, 2017 by Pat Fitzhugh. I’ll be appearing on the “Paranormal Kool-Aid” radio show July 15th at 9P Eastern / 8P Central. The discussion will center on two local haunts near and dear to my heart, The Thomas House and Octagon Hall, and why they should be on everyone’s paranormal bucket list. A “listen live” link will be posted closer to showtime. Make your plans to listen now. Get your spook on. Posted in authors, Ghosts, Kentucky, Paranormal, Scary, Tennessee and tagged author interviews, ghosts, Kentucky, legends, paranormal, Tennessee, witches on June 30, 2015 by Pat Fitzhugh. This event includes a meet & greet, lecture, Q&A, and book signing, featuring The Bell Witch – The Full Account and Ghostly Cries From Dixie. For driving directions, please plug the address into Google Maps. 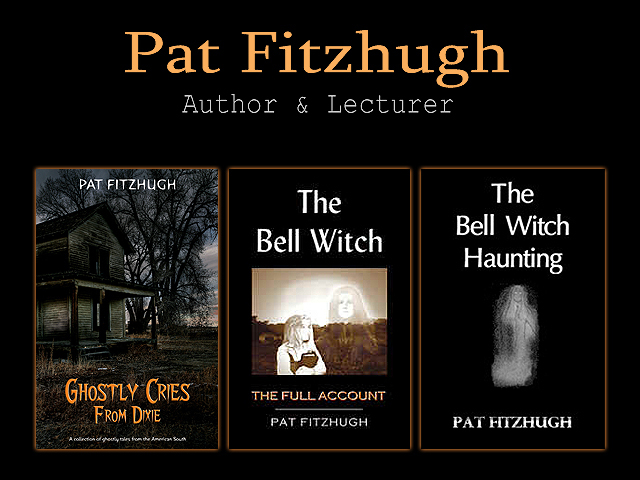 Posted in Author Appearances, Ghosts, Kentucky, Paranormal, Scary, Spooky, Storytelling, Witches and tagged author appearances, Bell Witch, book signings, ghosts, paranormal, scary, spooky, witches on January 11, 2015 by Pat Fitzhugh.